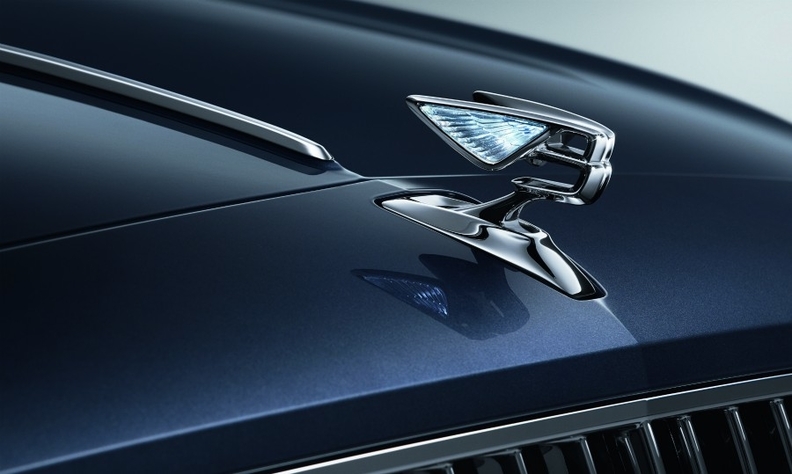 One teaser picture from Bentley shows a retractable Bentley emblem on the hood. Bentley gave a glimpse of its replacement for the Flying Spur sedan that it will position above the current model. The ultraluxury brand released two teaser pictures of the sedan. One picture in silhouette showed the car's long proportions. A second picture highlighted a retractable Bentley badge on the hood. The new Flying Spur is expected to be unveiled later this year. The four-door car is a sibling to the latest Continental GT coupe launched early last year. One teaser picture shows the car's long proportions in silhouette. Bentley will position the new Flying Spur above the current model to create more differentiation with the AMG and Maybach versions of the Mercedes-Benz S class, CEO Adrian Hallmark said. The Flying Spur will use the same Porsche-developed MSB platform as the Continental GT. A plug-in hybrid version is likely.